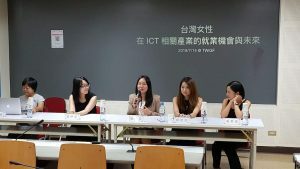 How to encourage women in Taiwan to work in ICT-related industries or start their own businesses. How to encourage women to speak up, especially about their skills in technical groups or communities. How to improve the position for women in Taiwan. Should there be a platform for women to ensure they have a position in each industry? Rio Kao, the moderator, is from a media company, The News Lens. Jessie Tang works in the blockchain technology company Bitmark. Evonne Tsai is from the eCommerce company Shopee. Hsin-I Chiu is from Vaco in San Francisco. Peifen Hsieh is from the International Affairs Committee, TWNIC. We had a 90-minute round table session and exchanged views with about 25 attendees. Diversity is important: it can bring benefits including different perspectives. Different genders and groups usually have different ways in thinking and thus contribute creativity and innovation to the larger society. Yes, women and men are different, but it’s complicated. When we talked about how to encourage women to work in ICT-related industries and to start their own businesses, we also talked about how this gender gap happened. There are complicated issues that impact this, such as psychology, education, history, religion, media, social expectation, social suggestion, etc., which affect to the whole environment. We all agreed that enterprises can show that they welcome women to work with them – whenever a programmer, a manager, or in business development. To have a platform for women is a good way to protect women. Thanks to the Internet, we can share our experiences by blogging and sharing to social media, including our career experiences and opinions. Peifen Hsieh shared the “sit-at-the-table” story famously told by Sheryl Sandberg of Facebook, and added, “once you sit at the table, don’t give your seat up easily.” We tend to see that many women can be excluded from decision-making, which can create a bad loop in the workplace. Technology helps women have voice, but we need a safer and more gender-friendly environment. To have a platform for women to share opinions is needed. We need a place, whatever online or offline, to share our skills with colleagues and friends. When more women participate, it creates more confidence and makes a positive loop to change the environment. However, women face the hate speech and harassment on the Internet more often than men in Taiwan. Their personal data can be exposed, which can make them feel unsafe and afraid to speak up. Making it safe is important. We encourage a gender-friendly environment. Technical communities and forums for women can make a difference. But it’s more important to make the whole society a safe place for minority groups, not just women. We should break the negative loop and create a positive loop by ourselves. Education is important, but students should know that gender should not limit what they want to be. There is no relationship between gender and career choice: a man can be a nurse, a woman can be an engineer. If we have more opportunities for women – equal pay for work, equal opportunities for growth and promotion – then more women will work in ICT-related industries, creating more women models and mentors. Our panelists talked about the issues and provided action plans. We will continue to have our TechGIRLS events. I hope my observations in the Women in ICT session can be of help for women and younger girls in other countries. I also look forward to having more opportunities to exchanges opinions with other women in ICT in the world. A longer version of this post appeared in Medium. It was edited by the panelists. The subtitle of the article was translated by Crystal Tu from Rio Kao’s opening remarks. Learn more about Internet Governance!